It is common opinion that the 19th century and the Victorian Era were a period of decline of the figurative arts and, particularly, of silversmithing. However, among 'silver collectibles' (more than in the field of 'great art') some exceptions may be found. 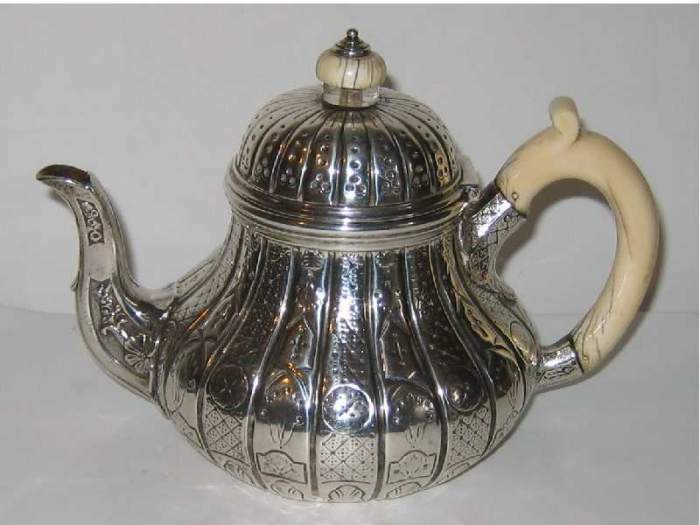 As an example of excellent quality silverware of the Victorian period we present three teapots, manufactured between 1848 and 1869 by well known English makers. This teapot was manufactured in London by Charles Thomas Fox and George Fox, belonging to an important silversmith family. 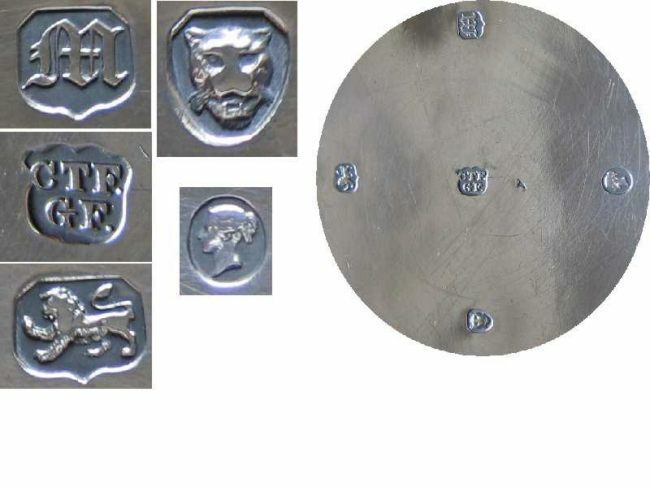 Five hallmarks are impressed underneath the base: CTF over GF (maker mark); lion passant (sterling standard for silver, 925 ppt); leopard head (Assay Office mark for London); an old English capital letter M (date letter for 1847/1748); Queen Victoria head (duty mark). The lion passant, date letter and maker marks are also struck on the handle, the lid and the finial. The teapot has octagonal shape and the handle is insulated by ivory rings (a common practice in the 19th century). The body and the cover of the teapot are fully engraved with floral and leaf decorations, following the 19th century rococo revival fashion. 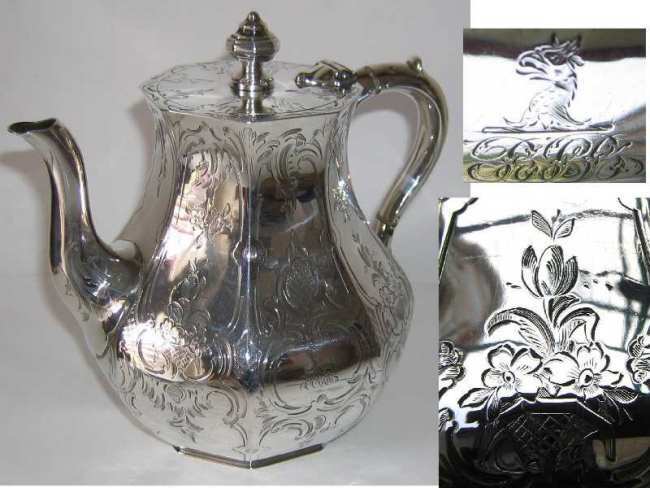 The teapot has the octagonal form introduced at the beginning of 18th century (late Queen Anne and the early Georgian periods), but the style is of typical Victorian taste, without any reference to the older shape. 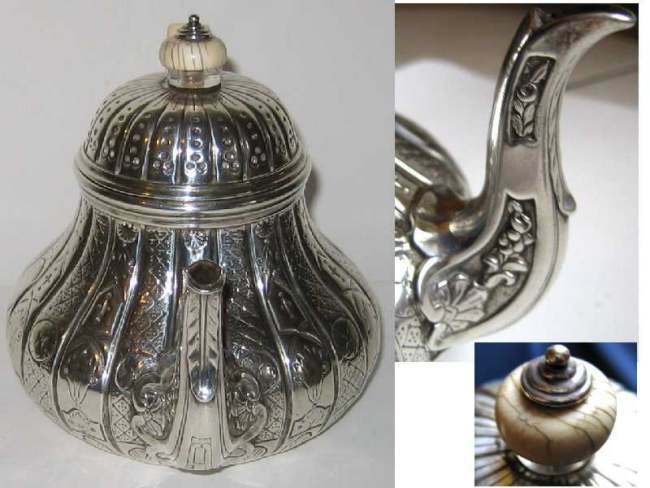 It is fully hand made using the 'sewing technique', with the body (obtained by working a flat sheet of silver) soldered to the base. 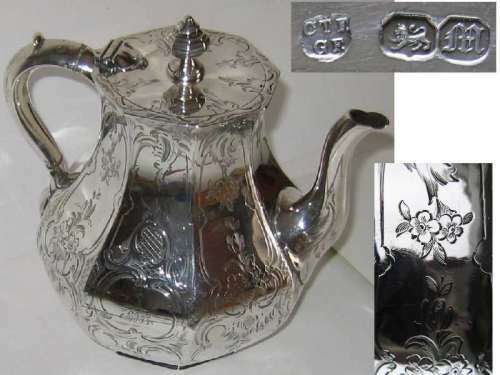 The teapot shows a high level of workmanship, mainly in the details. A family crest containing a mythological animal head completes the decoration. This teapot was manufactured in London by Royal Silversmith Robert Garrard, one of the most celebrated makers of the Victoria period, and the favourite silversmith of Queen Victoria. Underneath the base are impressed the hallmarks: RG under a crown (maker mark); lion passant (sterling standard for silver, 925 ppt); leopard head (Assay Office mark for London); a small old English letter 'a' (date letter for 1856/1857) and Queen Victoria head (duty mark). The base is inscribed 'Garrards Panton Street LONDON'. 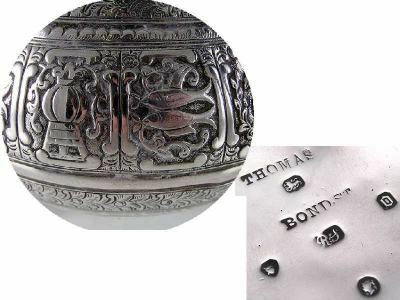 The lion passant, the date letter and the maker marks are struck also inside the lid. The pot has a pear shaped body which was in great fashion in the late Queen Anne and the early Georgian period. It has ivory handle and finial. The teapot is decorated with vertical segments embossed in medieval style, covering its entire body (the so-called 'neo-gothic' style). The pot is mainly hand made, but the body is manufactured using the 'spinning' technique (note 1). The manufacture is of high level, mainly in the details. 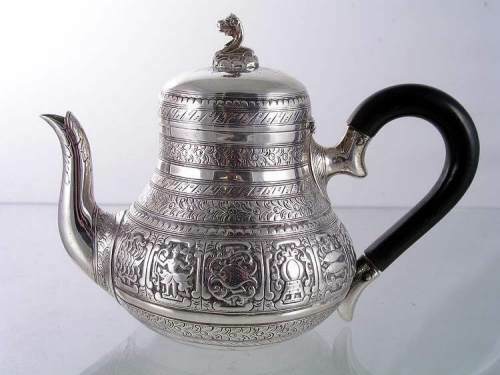 This teapot was manufactured in London by the silversmith Richard Sibley. 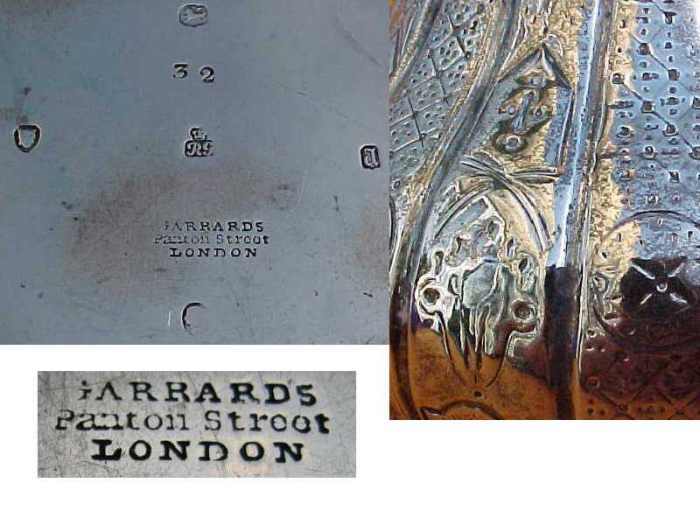 The hallmarks are impressed underneath the base: RS (maker mark); lion passant (sterling standard for silver, 925 ppt); leopard head (Assay Office mark for London); a small old English letter 'o' (date letter for 1869/1870)and Queen Victoria head (duty mark). Under the base is also impressed the inscription 'THOMAS BOND ST' (a well known London retailer). The lion passant, the date letter and the maker marks are also struck inside the lid. 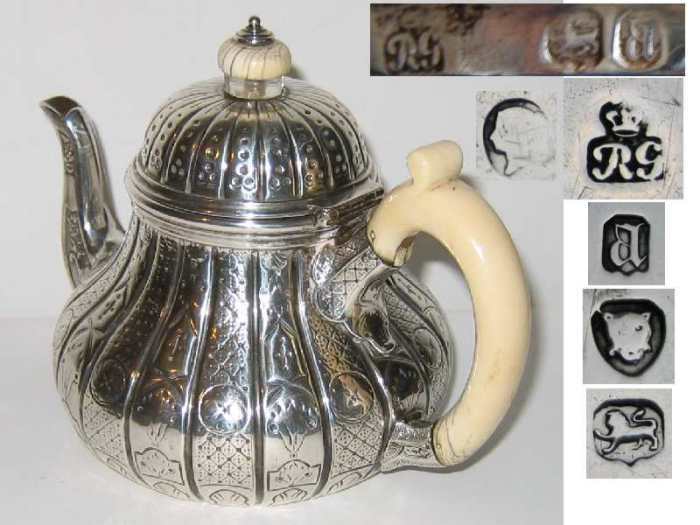 The pot has the pear shape body, a wood handle and a soldered silver finial in the shape of a snake head (usually the teapots' finials weren't soldered, but screwed down to the lid). The embossed decoration, held in horizontal sectors, is entirely inspired by Indian ethnic designs, including zodiacal symbols, covering the entire body of the pot. The pot is mainly hand made but the body is manufactured by the 'spinning technique' (note 1). The manufacture is of high level. (1) spinning: a technique introduced at the end of 18th century. A flat sheet of silver was pushed against a mould using a lathe. 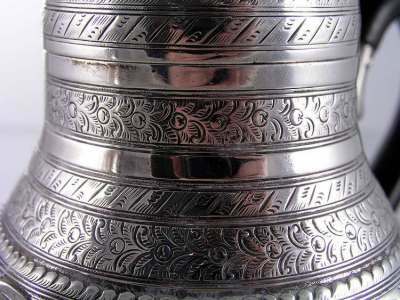 This technique, an outgrowth of the Industrial Revolution widely applied in 19th century, smoothes the pot's inside, avoids soldering and hammering signs (unless later intentional additions) but sometimes produces objects of meagre solidity and weight, requiring a double hem to reinforce the edge.